This property is simply one-of-a-kind. Pipeline Shores is the only three story house on the North Shore with over 7500 sq ft of spacious exotic living. The views are 180 degree panoramic unobstructed west facing beachfront from almost every room in the house. The Sunsets will blow your mind! The custom built stone Hot Tub, deck and cabana area provide an oasis for entertainment and cocktails while you watch the sunsets and surfing directly in front. You can literally see from Sunset Point to Waimea Bay and you are looking right down the barrel of the world class Pipeline/Backdoor surf spot. In the summer, the beach is nearly 100 yards wide and 7 miles long of clean white sand. In winter, you will not find better surfing and whale watching anywhere else on earth. Relax and Barbecue on the large lanai overlooking everything! The kitchen and dining area are enormous; the house features 'two of everything': two fridges, two dishwashers, two washer/dryers, custom bar area for living room. The top two floors are beautiful Brazilian cherry hardwood throughout. The spacious master suites (4 of them) all have their own beautiful stone/marble baths. With seven bedrooms, 4 futon beds, one twin bed, and a pool table room/entertainment area, there is room for everyone! Large balconies, outdoor toilet, showers. A few hundred yards away on Ehukai Beach Park you can play basketball, tennis, soccer, baseball, or just play with the little ones on the playground. You are located directly on the most beautiful white sand beach in the world. 2 full size French Door Refrigerators in Kitchen, Wine Captain, Beverage Refrigerator and Sub Zero Commercial Ice Maker in Living Room Bar. Extra full size refrigerator in garage. Brand New (March 2016) 6 burner gas range. Brand New (March 2016) gas oven. In ground large hot tub. Absolutely stunning location! The perfect spot. We had an extended family vacation at this home with 5 adults and 10 children. The house was very nicely furnished and set up, which made it comfortable and practical. The hard-wearing surfaces and simple decor made it very kid friendly while also being attractive. The weather was not the warmest that week, so we were happy to have the hot tub, spectacular views as we sipped our morning coffee, and plenty of room indoors for the kids to play games, pool, or hide and seek! There were a few disappointments however. At this price point I know you are paying for the abundant space and the stunning ocean views, but the pictures and some of the reviews are deceiving. The house is a little rustier than the pictures show and it needs a more thorough cleaning. Some bedrooms were missing shutters allowing the rain to pour in on that beautiful wood floor. There was a serious ceiling leak in the kitchen, the oven didn't close properly so it wouldn't heat very quickly. Also, some reviews implied extras like snorkel gear, fresh flowers, bicycles. We didn't see any of that. However, we did appreciate the large stack of beach towels, the boogie boards and the fact that someone came to give the hot tub a clean up after a few days of our kids using it as a pool. This house would improve with a little more attention to details, but we would be very happy to live in this house for another week! Aloha and thanks so much for the review. I wish the weather hadn’t been what it was during your stay but unfortunately I cannot guarantee weather... wouldn’t it be quite something if I could! The oven door was scheduled to be repaired 28FEB and was. Unfortunately, I couldn’t get the repair people out in time for your stay. The appliance is so new, it’s still under warranty. My apologies; I was also disappointed. The storm did blow out windows and create leaks that have since been repaired or scheduled for repair. Again, I’m sorry for anything that seemed as though it wasn’t being taken care of. Hopefully you’ll be able to return one day to the North Shore of Oahu and enjoy all it has to offer under sunny skies! Mahalo and Aloha! Views of surfers, beach and waves awesome. Easy beach access. Lots of bedrooms,bathrooms,showers even 2 outside showers for our large (18) family. About 1 mile to grocery store and Shark Cove tide pools, and food trucks. About 20 min drives to Dole plantation & Polynesian Cultural Center. Easy day drive to Honolulu. Love the sound of waves crashing right outside your window. Love to see the sunsets as well. Down side No AC. Lots of fans thru out house that helped but we weren’t use to the high humidity as well as the heat. Aloha and thanks so much for sharing your experience at Pipeline Shores... it really is great for groups like yours. With the exception of a few weeks, trade winds blow year round; perhaps your next visit will reflect that! We hope to have the opportunity to serve you again! 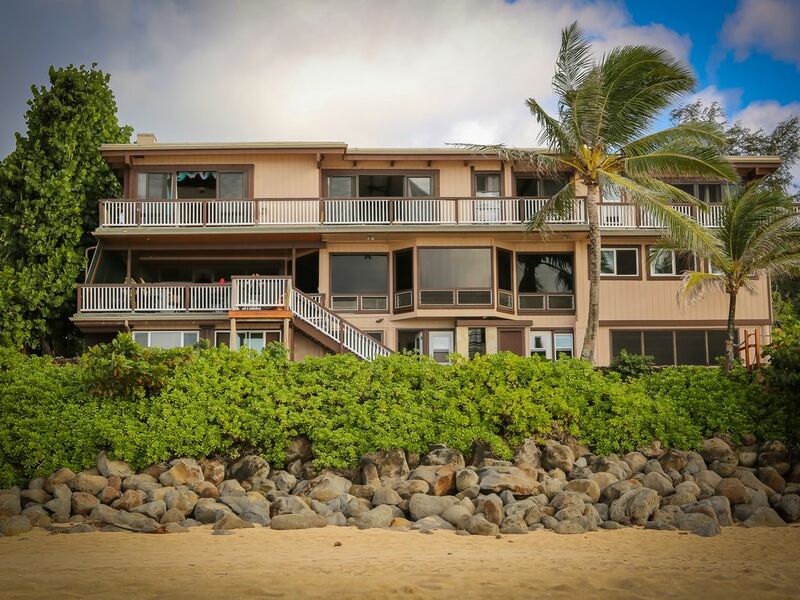 This was truly a wonderful property for our family to reside at for a week in Hawaii. The home was well maintained and the owners were delightful to work with before and during our visit. Thank you and we will cherish life-long memories of our vacation. We thoroughly enjoyed our stay at Sunset Beach. The property was convenient, had plenty of room to be together or places for peace and quiet. We enjoyed the easy access to the beach, watching surfers ride huge waves and whales crest in the background. With 7 bedrooms we could and a large open living room/kitchen, we could hang out together or escape to one of the bedrooms with a balcony. Mariam was great to work with and provided excellent customer service. Trip of a lifetime on the beautiful North Shore! This Home and vacation was a dream come true for my brother and his family of 20! Miriam was so wonderful to work with and made booking and arrangements so easy. The home was beautiful, with rooms and space to comfortably accommodate all. The views and location were amazing, and sunsets were stunning! This was the first big trip my brother and his family had all been on together, and they said it was a dream come true! They did many activities close to the home, and enjoyed the time they just spent there relaxing, and watching the waves and surf. I am planning on booking a stay there with my family very soon! 15 Minute drive to Polynesian Cultural Center and Brigham Young University (BYU). Biking and walking distance to Shark's Cove and Foodland and Coffee Bean along scenic bike path. Many local restaurants and shops within biking and walking distance. Ten minute drive to the town of Haleiwa. World class diving, fishing, snorkeling, surfing all within steps of your door! Basketball courts and tennis courts a short walk away at the local park. World Class Skate park a short walk away.